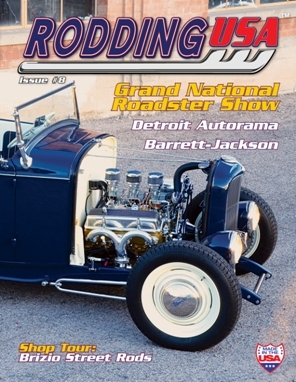 Rodding USA is “Made in the USA” and the new issue is jam packed with the high quality content that our readers have become accustomed to receiving. Issue #8 begins our second year and we appreciate all of you that have supported us and continue to spread the word to your friends and colleagues. Features in this issue include Tennessee resident Ronnie Goodwin’s stunning 1932 Ford roadster that was in contention for the prestigious AMBR at this year’s Grand National Roadster Show. Also featured is a very cool 1929 Ford RPU from New Jersey along with a historic Deuce hi-boy, a ’40 Ford coupe, ’30 Ford Vicky and a ’49 Ford Woody sporting a Cadillac power plant that was installed in 1950. We also give you an in-depth look at events that include the GNRS, the Barrett-Jackson auction in Scottsdale and a trip to the Detroit Auto Rama. Other features include a tour of Roy Brizio Street Rods in South San Francisco, CA, a look inside the Rodding Digs of Deluxe Speed Shop in Colorado and many other interesting stories. Rodding USa, by hot rodders for hot rodders.